Saturday 20, Sunday 22 and Monday 23 February I visited Manchester. 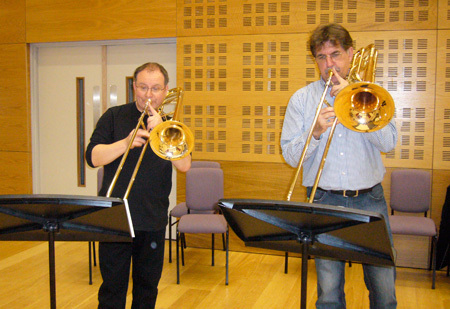 The main reason was to be guest soloist during one of yearly British Trombone Society days at the Royal College of Music in Manchester. 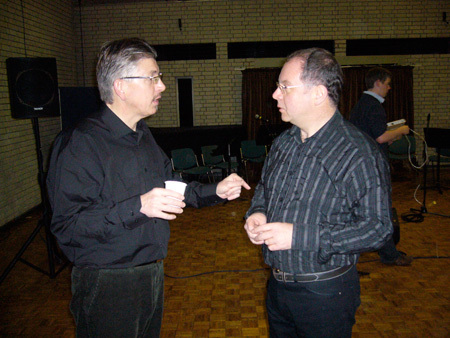 The host was Professor Chris Houlding of the Folkwang Hochschule, Essen/RNCM. Chris invited both Niels Ole Bo Johansen ( Professor at the Roayal Academy of Music in Aarhus, Denmark ) and myself to work with his class in Manchester. On the Sunday afternoon concert Niels conducted a great composition by Rene Mogensen for 8 trombones and tape, Ares Dearms of love. I had the honor to play 2 pieces with the Manchester tormbone class, Steven Verhelst "Capriccio" and Ilja Reijngoud's "Ballad for Mr Roberts". Niels and Chris premiered a piece for 2 trombones and tape by Wayne Siegel and together with me Chris premiered a duet written by Ilja Reijngoud named "Tell me". Both pieces are written for Chris's Duet cd and Chris and myself recorded our piece on the previous Saturday. Chris already recorded duets with Joe Alessi, Don Lucas and will recorded one with Jiggs Whigham soon.